So, not sure if I’ve mentioned but Emma and I are doing our first half-marathon this coming weekend (31st Jan ’16) in Marrakech…yay!!! YAY!!! – I almost sound excited!! On Saturday Morning we catch our flight to Marrakech. We have a day of getting our bearings (although I’ve heard that’s very difficult in the Medina? ), then race day on the Sunday. We then have a few days of exploring before catching a return flight back to the UK. I will certainly be sure to post our thoughts and experiences when we return. In the meantime, if you have any recommendations and tips for our trip then please share. It was an unusual feeling but in November 2015 I seen my grandmother for the first time in approximately 10 years. There is no particular reason for not seeing her for so long. Life I suppose, in some unfortunate and selfish turn of events. I cant even use the fact she lives in Germany as an excuse – its only an hours flight away! My wife and I took my mum too. She also hasnt seen her mum for 10 years. Truth be told, the last time we seen my grandmother was when she had settled in to a new care facility following a harsh stroke that forced her out of her home and in to long term care. Her husband, my grandfather, had died about a year before following many health deteriorating years. This was a direct result of the lifestyle he led Im sure. The disappointing part of all this was that my grandmother was just getting her life back after spending many years looking after her husband, that she too, unexpectedly, suffered the same fate as her husband. A major stroke closed the door on so many more able-bodied years and placed her in to a lifetime of care. We had booked ourselves on to a early flight to Dusseldorf, a city we hadn’t visited before and a city I actually had no intentions of visiting. Not sure why, I suppose there are so many other places I would prefer to go to first. As it transpired, I was so glad we decided to spend our first night in Dusseldorf before driving to see my grandmother. The city really is the cosmopolitan stylish city I wasnt expecting. Lots of shops (too high end for me! ), restaurants and bars, flash supercars around every corner. It really was quite the surprise. The other added bonus was that it was the first weekend of the Christmas markets and no better place to buy a currywurst and a beer. That brought back some memories. Well, the next day was all about my grandmother. We took off mid-morning and headed up the autobahn to a town I spent much of my childhood. As we got closer it was bringing back so many memories and I certainly arrived with a smile on my face. Before we went to the care home, we went to my mums sisters (my aunt!) house. She lives close to the care home and was taking us there for our “introduction”. When we arrived at the care home, I could see the face of my grandmother peering over a communal dining table. I could see she was looking at us quizzically and could understand why – 10 years is a long time. As we approached, I called to my Oma (German for grandma), she looked up through her thick glasses with a wry smile opened her arms in readiness for a bug hug. A flood of memories and emotions washed over me, it was without doubt a homecoming. Before we had arrived my aunt had told us of my grandmothers state of mind. In short, she is easily confused. She doesnt recall being told her youngest grandson (my baby brother) had died and after 10 mins of reuniting with her she didnt recognise me and only acknowledged her grandson Andrew as the person in the pictures hanging on her wall. We left that day having seen the woman we loved very much. She was (is) the most amazing grandmother ever. But we left with a deep heart as we only seen glimpses of the woman we remember. She is someone her deserves better. So whilst I/we achieved something, I left with disappointment and some guilt. I could have gone to see my grandmother sooner, I could have seen her when she was perhaps a little more “with it”. I could have perhaps seen more of the woman I grew up with, my Oma. If there is something to be learnt it is this; dont put things on hold, thinking it will be ok until next week, next month, next year. Before you know it, you are 10 years down the line. Do it now, whatever it is. Tomorrow may never come. I started 9to5escapes.com with all good intentions of posting some tales of our adventures, domestic and abroad. Whilst the adventures havent stopped, I seem completely incapable of putting up some content, even in recognition of our travels this year. We have had some amazing journeys in 2015 including Germany, Krakow, Singapore and Indonesia and many trips around the UK. But heres to 2016. A year where we have secured trips to Marrakesh, Italy and South Africa already (its always great to have something to look forward to), and hopefully a few more trips elsewhere in between. So heres to you and yours, wishing you all safe travels in 2016. Vegas is, simply, an awesome place that every person must visit at least once. For us, we went twice within 18 months because we loved it that much. With Christmas fast approaching (yes, I know, I said it…. ), its time to get your festive travels planned. In recent years I have found myself to be spending a lot of time in Norfolk and Suffolk. There is good reason for this. Its bloody gorgeous, thats why. Considering I have lived in the neighbouring county of Cambridgeshire for a number of years, its only been in the last 3’ish years that I have actually ventured past the borders to these beautful counties. Not only are these counties home to some of the best (in my opinion) beer and cider, Norfolk and Suffolk boasts stunning scenary. The outdoorsy type will, without doubt, love this part of the country. Walking and cycling routes are plentiful and you cant go to this part of the country without visiting the Broads. So, getting around by car (and Ill assume any form of motorised transport) can be slow, painful at times but ultimately worth it. If you are in the mood for seeing a part of the country that is so quintessentially english then I can think of no better place. We explored the broads by boat, starting our journey from Wroxham, a beautiful little town just 10 minutes north of Norwich. There are plenty of boat rental companies in the area offering a range of cruisers to suit your needs. We opted for a 4 berth, which was big enough for the two of us and our dog Strudel. 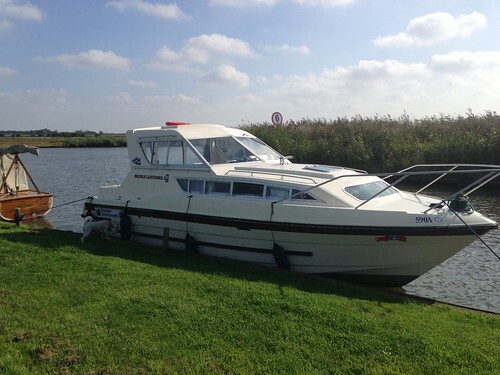 Cruising the broads is a thoroughly relaxing venture, but again, like the roads around here, you dont get anywhere quick. But thats the point. Drink it in because the small villages and towns that nestle on the banks are stunning. There also isnt a shortage of good pubs, serving good beer and food to keep you fuelled on your travels. Simply put, we love this place. We hire a mobile home/lodge on the Pinewoods park every year for the last few. The park, as you guessed, is situated right next door to the Pine Woods! It offers great walks along the beach and beyond. Our dog absolutely loves it. The town itself is just lovely. A proper little seaside town with the usual type of shops offering all sorts of knick-knacks (or all sorts of crap – whichever way you look at it). As with any seaside town, it just wouldnt be the same without a good quality fish and chip shop and I’d struggle to find a better one than Frenchs. Take a walk up through the town and you’ll hit a green where there a couple of pubs. They welcome dogs, serve a good pint and the food is great. But if you fancy a takeaway, then there is plenty of choice and they will deliver to the Pinewoods park too. For a few cheap days away, with good walks, pubs and a decent escape from the “rat race”, then this place is a must. Its a great base in which to explore this part of Norfolk. I went to Southwold for the first time just a couple months back. Why the hell did I wait so long; love this place. Southwold really is a busy (yet not over the top), beautiful seaside town in Suffolk that offers families, couples and an army of friends to have some serious fun. Southwold is home to Adnams; simply the best beer (and other alcohol treasures) that is likely to grace your lips. Yes, it really is that good! You will not be surprised to see a host of stores and pubs selling Adnams. You must, without doubt, pick up some of this fine ale. Not to mention, their spirits selection is gorgeous (I can highly recommend the Gin). Aside from the lip-smacking alcoholic treats, Southwold is in a great location in which to explore Suffolk. Many beautiful towns nearby to offer an alternative experience to the seaside retreat. How many times have you fell in love with a place because the food is just so damn good? That place could on face value not be very special at all but the food just skyrocketed it up there with the best of them. Adversely, your destination could be a paradise, your dreams come true, only to be smashed by poor food experiences. Here are some thoughts on destinations we have been to and whether they fell short or propelled them in to the must go destination. At this point it should be noted that I am no “foodie”. In fact I know bugger all when it comes to making such gastronomic delights. I just know what I like – good, honest cooking that tastes good! Krakow to be precise. Besides being a beautiful city, there is a mass of dining destinations. Poland is great value, which makes everything better, right? Poland is renowned for its simple yet tasty feasts, almost always meat based. But, the city is full of restaurants offering an alternative, from Asian and Italian to Indian and Middle-Eastern. Throughout our stay, the food was exceptional and great value. Coupled with a thriving and visually stunning city, puts this place in our top ten European destinations. From Bangkok to Khao Lak, Thai food is AMAZING. I love spicy food and this country hit every taste bud hard. Delicious. The fish, rice, noodles, meat, chicken, soups…everything that was put in front of me was devoured. As you probably guessed, I fell head over heals with this place! Emma is a fussy eater and before our arrival, she was nervous about her food options. This was quickly dispelled with sensory overload. Her worries and concerns, gone, replaced with a large helping of green curry! Thailand is up there with the best. From Bali to Flores, this country is stunning. The people are among some of the friendliest we have ever come across. The food however, well, disappointed us generally. I dont know why but we had high hopes of Indonesian cuisine. The easiest way for me to describe what we had is; dull. Nothing really jumped out at you as being so mouth wateringly delicious that you had to have more. It was all very edible, dont get me wrong, its just not that exciting. Maybe your experiences was very different to ours? We have both travelled to Italy many many times, visiting a number of cities and regions. The thing with Italy, especially in the tourist hot spots (e.g Rome), is that the food can be a little slapdash and unimaginative. I have eaten in many restaurants throughout Italy (in those tourist traps) and have, on many occasions, had better Italian food outside of Italy! I will hasten to add that I have also been to many restaurants off the tourist trail and had some of the best food ever. For me, Italy has been hit and miss. Pick your restaurant wisely. Well, what can I say about Germany other than vegetarians need not apply! Joking, in recent years, especially in the larger cosmopolitan cities, there is bundles of choice. But, there is no escaping, Germany is a meat feast. I am a little biased as I have German family and spent my early life living in Germany, but, the food is seriously tasty. You just cannot beat a currywurst sausage! After something a little more adventurous then there is plenty of great restuarants serving up stunning feasts – and not always meat based! Whats your thoughts? Has your views on a destination been swayed by your food experience….? In the UK, employees are typically given 5 weeks paid holiday per year. In the USA, I understand this to be less. In addition to this paid holiday time, we have 8 bank and public holidays in a year (in England and Wales). The challenge of a 9 to 5 travel enthusiast is how to use this precious time. Many if not all of the bank and public holidays fall in to kids school holidays. For a couple that dont have children, travelling, especially in UK and Europe, becomes very expensive. So needless to say, we tend to avoid this time. However, we have learned over the last few years that long haul destinations (excluding the likes of Florida etc where this becomes a mecca for long family holidays) are not typically affected by the price hikes enforced upon us by the travel industry – thats a whole other subject! As with everything, its all about the balance between time and money. We have many destinations in our minds and we usually have one 2+ week holiday per year with several other mini-breaks either side. But every year, we battle with decisions on where to go and what to do. We are not a couple that can lounge around a pool, sipping cocktails all day and stuffing our faces from the all you can eat buffet (although that does sound really good about now!). We like to be active, whether that is exploring a city by foot or cycling around Brittany. It has been suggested why not give up the 9 to 5, why not pack up and go explore the world we are so desperate to see? Despite our love for travel, it isnt about giving up on the life we have chosen. We dont hate the 9 to 5, we enjoy the challenges in life this brings. Its about escaping the norm, overloading your senses with something so fresh, new, different, that the 9 to 5 life is a distant memory. Sure, these breaks come to an end and we are back doing what we was doing just a couple weeks before. But we are now refreshed, got great memories and momentoes and a new chapter in our challenge to escape, even for just a moment, the hectic lives we lead. The 9 to 5 enables us to enjoy the supposed luxuries of a nice home and lifestyle but also enables us to see a world beyond the bubble we and our 9 to 5 compatriots can become slave to. The challenge is thus; live now. If you have a thirst for travel, do it. It is doesnt have to be expensive or time consuming. There are many great locations just a short drive or flight away. Thats what weekends are made for!